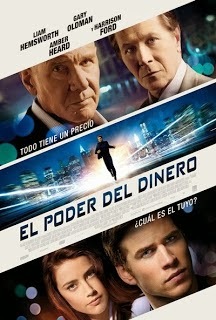 Reparto: Liam Hemsworth (Adam Cassidy), Gary Oldman (Nicholas Wyatt), Harrison Ford (Jock Goddard), Amber Heard (Emma Jennings), Josh Holloway (Agente Billups), Embeth Davidtz (Judith Bolton), Richard Dreyfuss, Lucas Till (Aaron Cassidy), Julian McMahon (Meechum), Angela Sarafyan (Alison), Charlie Hofheimer (Richard McCallister). Guión: Jason Dean Hall y Barry Levy, basado en la novela de Joseph Finder. Producción: William D. Johnson, Alexandra Milchan y Deepak Nayar. Productoras: Gaumont, Demarest Films, EMJAG Productions y Kintop Pictures.